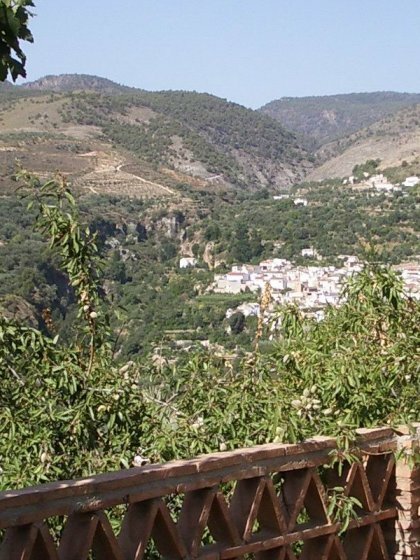 The Cortijo del Pino ( altitude 738 mts ) is 300 mts from the village of Albunuelas ( vineyards in Arabic ) , a 5 minute walk from the house The Village boasts three supermarkets and 2 simple fare restaurants, and more sophisticated ones 5 mins away, chemists and medical center. 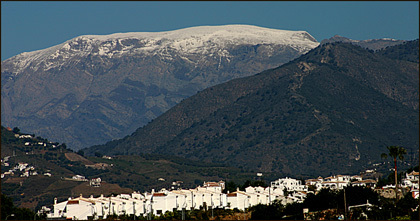 This is one of the white villages in the fertile valley of the Lecrin which the Moors called " Happy Valley " . Nearby are Saleres , Restabal , Melegis and Chite. The Valley is picturesque with a lush landscape which has attracted many painters to the studio at the Cortijo - the backdrop of one of the peaks of the Sierra Nevada dominates the scene. A walkers paradise - the GR7 passes through the valley and a natural park is on the doorstep, guided walks, horse riding are on offer. The village fiestas take place in August. The Cortijo organises a one week painting holiday in September for painters of all abilities.